I was super duper excited when my brother and I got invited to the launching of Honeybon's Sakura Mango Cake at Honeybon Pastry Shop along Katipunan Ave. in Quezon City. 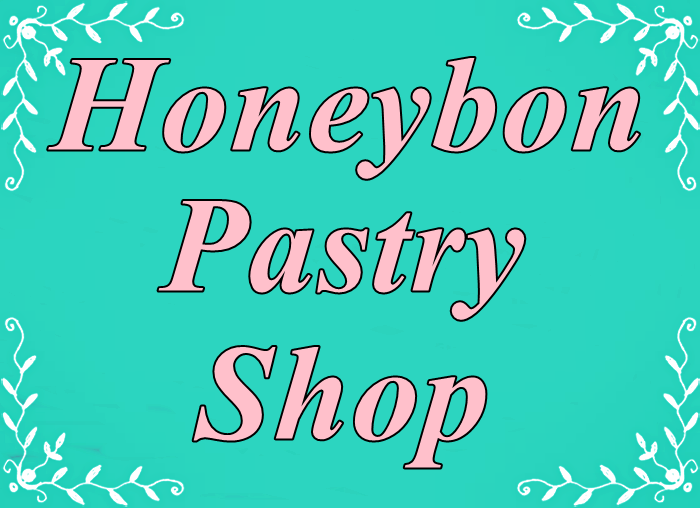 There was a little confusion at first because the signage says “Honeybee Patisserie and Cafe” and the guard on duty pointed us to another location when we asked him where Honeybon Pastry Shop is. We ended up in another establishment at the far end of Katipunan Avenue. We even asked several people along the way but they kept on pointing us to another establishment named Honeymoon. We decided to turn around and return to Honeybee. This time around I alighted from the car and asked inside. We're the second one to arrive. I felt bad for my brother because we ran out of fuel right after we parked our car. My brother had to walk under the scorching heat of the sun for a total of almost one kilometer to and from the nearest gasoline station. Moving on, Honeybee or Honeybon is actually a sister company of Tokyo Bubble Tea. We Iearned from the marketing manager that the owners are actually a husband and wife team. The husband manages the tea house and the wife handles the cake shop. That is why you'll find cakes at every Tokyo Bubble Tea branches with the exception of provincial branches. We waited for more than an hour for the other bloggers to arrive. Then the program started and the secret behind the curtain was finally revealed. It was none other than the Sakura Mango Cake! It looks so dainty! This unique Japanese style cake was lovingly developed by Aileen Tan, owner of Honeybon Patisserie & cafe. It reminds me of the sakura season in Japan. Sardines in Oil and Garlic with Lemon Pasta - very delicious. The 2-floor restaurant houses the two brands. Tokyo Bubble Tea and Honeybon are basically Japanese food chains. The former are known for serving Japanese fusion food and sensational milk teas and the latter serving pastries. There are Honeybon stalls inside every branch of Tokyo Bubble Tea and it’s only in Katipunan Ave. that they almost equally share the space. That is because Honeybon Katipunan is the flagship branch of the Japanese designer cake shop. The staff are really polite and the shop itself has a nice spacious feel. I have had afternoon tea and cake at some of the best establishments in the Metro but this establishment makes me feel so comfortable and welcome. I super love sweets especially with chocolate cake and I guess their presentation on each cakes looks so delish and so mouth watering.I want to try that sakura mango cake!